If you like peanut butter, you’re going to LOVE these Peanut Butter Cup Cookies. 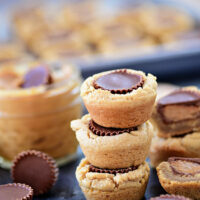 A peanut butter cookie cup with a chocolate covered peanut butter cup in the middle! Christmas is exactly a week away, and for some of us, that means scramble time. Have you baked cookies yet? Have no fear, I have a super easy cookie recipe for you. It’s a classic that everyone loves, you could probably get away without baking any other cookies for Christmas. I squeezed in a little baking and made a few favorite holiday cookies over the weekend. 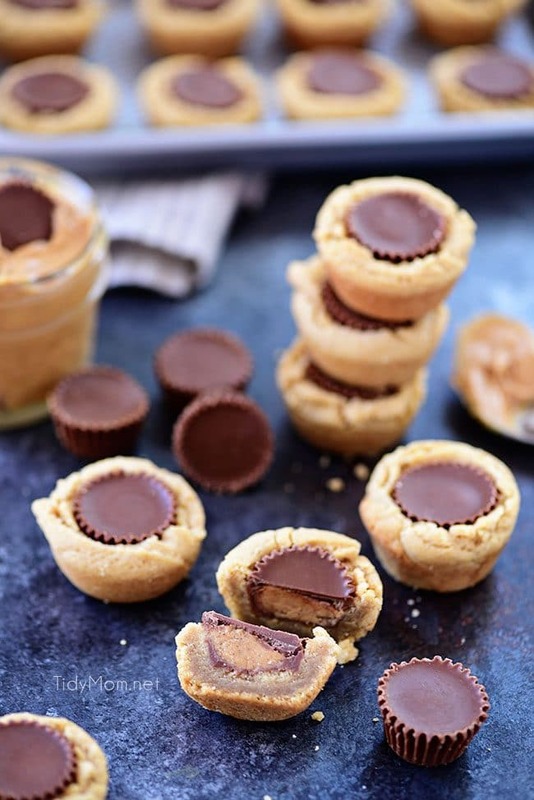 I made Shortbread Spritzer cookies, Russian Tea Cakes (my favorite), Peanut Butter Blossoms, and these Peanut Butter Cup Cookies (my husband’s favorite). I shared these on Instagram stories and had so many ask for the recipe. That’s when I realized I have never shared these here for you all!! 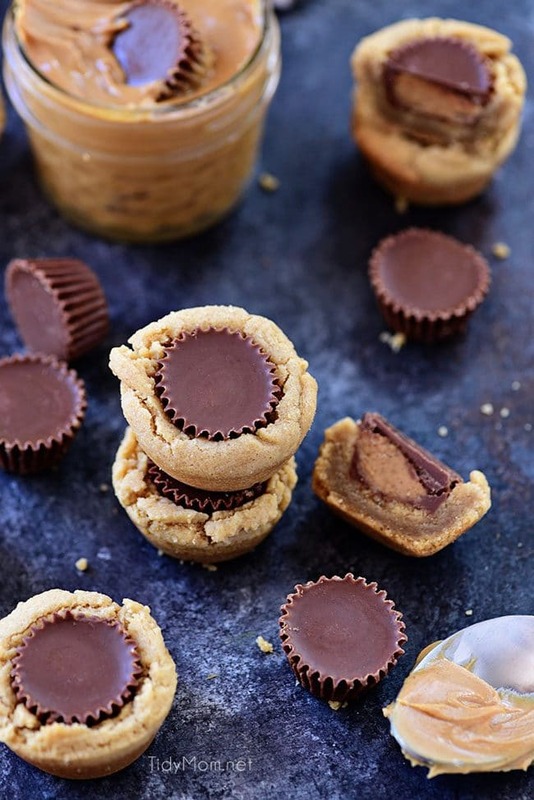 They are a classic recipe, that’s been around forever, but I do have a few tips to share along with the recipe that will make your peanut butter cup cookies a success!! If you love peanut butter or have a peanut butter lover in your life, you have to make these cookies. Seriously – that peanut butter cup inside……. I can’t even handle it. 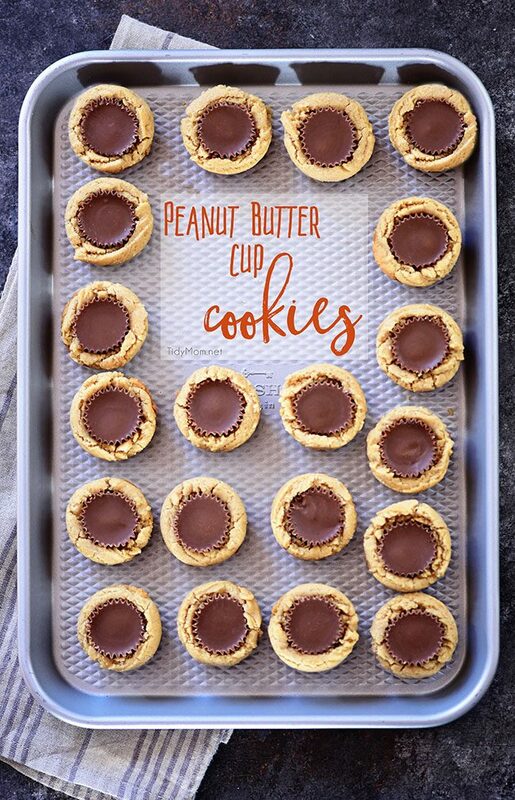 While these peanut butter cup cookies are really very easy to make there are a few tools and tips that help make them a success! A mini muffin pan is needed for this cookie recipe, but do yourself a favor, and make sure you have at least two pans, to speed up the process. These peanut butter cup cookies stay in the pan and go right in the refrigerator to cool for about 20 minutes. If you have two pans, you can have another pan in the oven, while the first batch is cooling. While a mini muffin pan is required for this recipe, a cookie scoop is not required, but will definitely make the process quick and your cookies will all the same size. I use a small cookie scoop to place the cookie dough into my hand, roll into a nice ball and place in the pan. If you don’t already have a cookie scoop, once you have one (I actually have 3 sizes), you’ll wonder how you ever made cookies without one!! Place unwrapped peanut butter cups on a tray or plate and put them in the freezer until ready to use. This will keep them from melting when you press them into the hot cookies. Do NOT use natural peanut butter in this cookie recipe. Any no-stir, non-oily peanut butter will work. Use a small cookie scoop, so you don’t overfill the muffin cups. Using a cookie scoop assures you that you have the correct amount of dough, and all your cookies are all the same size – and it saves you time!! If you only have one pan, roll all of your cookie balls, and place them on a plate so they are ready to go when your pan is ready. If the dough it a little too sticky to roll, you can chill the dough for about 20 minutes to make it easier to handle. When measuring the peanut butter, spray your measuring cup with a little no-stick spray, and you’ll have an easier time getting all of the peanut butter out of the cup. Don’t overbake the cookie cups. They may not look done, but 8-10 minutes is all they should need. You can use an oven thermometer to make sure your oven is heating to an accurate temperature. If you don’t want to see as many cracks in your cookie cups, let them cool about 5 minutes when they come out of the oven. The center will start to collapse, and that’s when you can press the frozen candy in the middle. You can press the candies in as soon as they come out of the oven, you just might see more cracking in the cookie cup, but they’re still delicious! 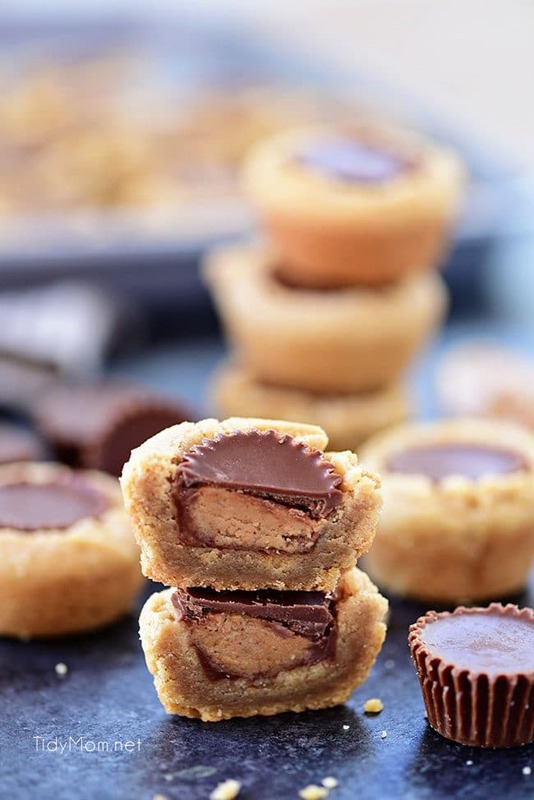 After you push the peanut butter cup in the center, place the muffin pan in the refrigerator for 20 minutes to cool. This will allow the cookies to cool, without the chocolate candy melting and easier to remove from the pan. 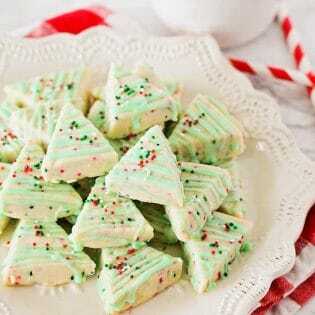 Use a butter knife to gently remove cookies from the pan AFTER they cool in the refrigerator. Peanut Butter Gooey Butter Cookies are also a favorite in our house, but I’m always looking for more peanut butter cookie recipes to try. These Chocolate Peanut Butter Cookies and these Peanut Butter Nutella Swirl Cookies are both on my to-bake list now. These Peanut Butter Chocolate Chip Shortbread Cookies sound amazing with a cup of coffee, I need to add them to my list to make sooner rather than later. Peanut Butter Cup Cookies are favorite treat any time of year, and perfect for Christmas cookie trays and cookie exchange! I would love to hear about your favorite holiday cookie recipes!! 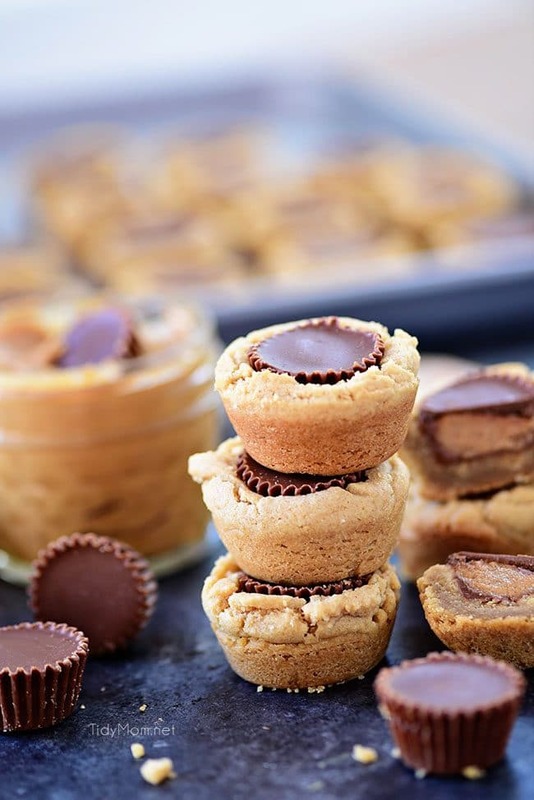 IF YOU LIKE THESE PEANUT BUTTER CUP COOKIES RECIPE, PIN IT! Preheat oven to 350° and lightly grease mini muffin tins. Place unwrapped peanut butter cups on a tray or plate and put in the freezer until ready to use. Using a large bowl and electric mixer, cream butter and sugars and peanut butter until fluffy. Beat in egg, vanilla, milk until well incorporated. Add salt and baking soda and continue beating, then gradually add flour and mix until just combined. Using a 1 tablespoon cookie scoop, drop cookie dough balls into prepared mini muffin tins. Bake for 8-10 minutes. 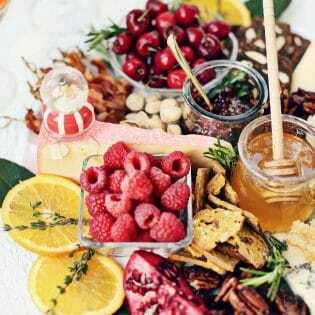 Remove from oven and remove candies from freezer. 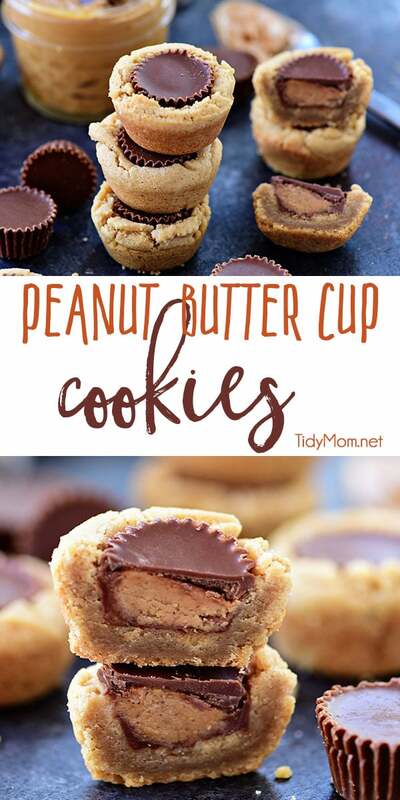 Immediately press peanut butter cups into each cookie, and place pan in refrigerator for about 20 minutes (this will allow the cookies to cool without the candies melting). Once cooled carefully remove cookies from pan and place on cooling rack. Store in an airtight container and hide them.....they disappear fast! I’m pretty sure I wouldn’t be able to stop once I started popping these little guys into my mouth ~ pinning and sharing! all you have to do is use already made cookie dough, it makes it faster to make and tastes great do it all the time! I’ve made these for many years and they’re a family favorite. I’ve never frozen the candies nor placed the pan in the refrigerator to cool quickly. I also use mini muffin paper liners so it’s easy to remove the cookies from the pan. If I’m in a pinch and don’t have time to make cookie dough, I’ll use store bought dough. Nestle Tollhouse chocolate chip cookie dough is my go-to substitute. For Halloween, I add a candy corn on top of each cookie and do similar toppings for other holidays. It’s a fun cookie to make. I have made these for years. But I always bake them with the chocolates already in the cookie dough. Just press them in and bake. Makes it easy!